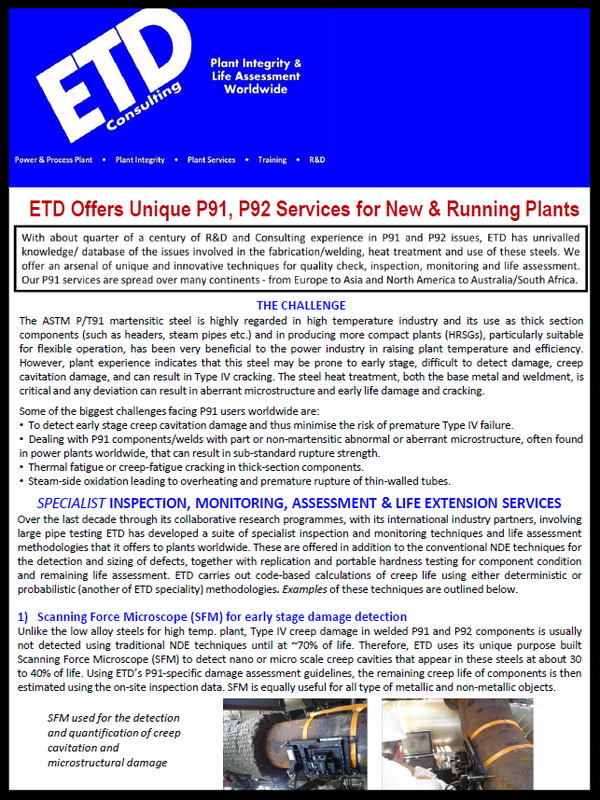 a) Inspection, Monitoring, Assessment & Life Extension Services: Over the last decade through its collaborative research programmes, with its international industry partners, involving large pipe testing ETD has developed a suite of specialist inspection and monitoring techniques and life assessment methodologies that it offers to plants worldwide. These are offered in addition to the conventional NDE techniques for the detection and sizing of defects, together with replication and portable hardness testing for component condition and remaining life assessment. ETD carries out code-based calculations of creep life using either deterministic or probabilistic (another of ETD specialities) methodologies. Examples of these techniques include: Scanning Force Microscope (SFM) for early stage damage detection, Miniature sample removal (boat sampling) for quality checks and life/condition assessment, Precision Portable Hardness Tester (known as ‘Smart sleeve’), ‘Obikou’ for Pipe Strengthening and Life Extension and Defect/Crack Assessment. b) Root Cause Failure Analysis: Over the years ETD has developed an expertise in the root cause failure investigation of P91 and P92 components/welds. In the recent past, ETD has investigated a range of failures of T91 tube components and welds, and cracking in P91 pipes and drain-line components in conventional boilers and HRSGs. In these investigations, ETD identifies the root cause of the damage, and proposes remedial actions and solutions to the problem. c) Consultancy & Guidelines on Materials & Welding: ETD provides P91 and P92 users with advice and guidance on the metallurgy, welding and heat treatment of these steels. This service includes reviewing weld procedure specifications (WPS) for similar and dissimilar metal welds, inspection of NDE records, and guidelines for repair welding of P91. The advice is provided to both the plant operators and designers/ manufacturers. This advice is based on ETD’s P91 experience in a number of Group Sponsored Projects including its running of the International P91 Users Group (Int. P91UG) for international industry over more than a decade and its involvement as consultants to many a power plants worldwide. For further details of our P91/P92 services and opportunities being offered, please click on the image above. a) Traditional NDE inspection: Using, for example, Boroscopy, PAUT (Phased Array Ultrasonic Testing), EMAT (Electromagnetic Acoustic Testing), PEC (Pulsed Eddy Current), LFET (Low Frequency Electromagnetic Testing), Replication (including replica assessment), Hardness testing, Wall Thickness profiling, Oxide Thickness measurement etc. b) New state-of-the-art Innovative NDE Inspection Techniques: Developed through ETD’s collaborative joint industry projects. This includes equipment such as (details later in this brochure): a) Portable spark erosion ‘boat sampling’ machine (called EDSE), b) Portable Scanning Force Microscope (SFM) for on-site early stage nano and micro level damage detection especially in materials like P91, c) ‘Obikou’ pipe reinforcement technique which offers creep life extension of creep damaged seamless or seam welded pipes, by simply and quickly reinforcing them with multiple layers of a thin high-temperature alloy strip, and, d) Our newly invented first of its kind portable ‘precision’ hardness tester, called ‘Smart Sleeve’, which improves the accuracy of the ‘MIC 10’ or other portable hardness testers. c) Integrity/ Life Assessment: In addition to inspection, ETD offers independent and impartial plant safe remaining life assessment using both deterministic and probabilistic techniques. It has its own software for crack assessment, RBM/ RBI and carries out routinely both root cause failure analysis (RCA), replica and life extension/ assessment for pressure parts and turbine components and RCM. Details of the services and opportunities being offered can be seen by clicking on the image. In response to the needs of the international industry, ETD Consulting regularly launches new multi-client projects which are open to all. ETD has excellent expertise through its in-house R&D, plant service/technical consulting and project management experience and links with plant manufacturers, plant operators, service providers and researchers from around the world. The company is thus in an ideal position to conduct such projects on behalf of project partners/sponsors and bring together plant experience from best run plants and the latest technology development in Europe, Japan, USA and elsewhere. The benefit of joining these GSPs, in which costs are shared, is that each participant gains the data and results of the whole project at a fraction of the total project cost. All work is carried out by ETD and its expert staff/ consultants but the sponsors determine its direction. As a result of a partnership agreement with a Power Company in Japan, ETD now offers this unique patented technology service worldwide (including Japan) for the creep life extension of high temperature, high pressure pipelines, especially those already showing creep damage. “Obikou” is an on-site service for power, process and other high temperature plant and has shown to achieve creep life extension by a factor of about 4. It simply involves quickly reinforcing a potentially vulnerable or creep damaged pipe with multiple layers of thin high-temperature alloys strip that is wound/wrapped around a pipe thus halting/ reducing the development of creep damage. 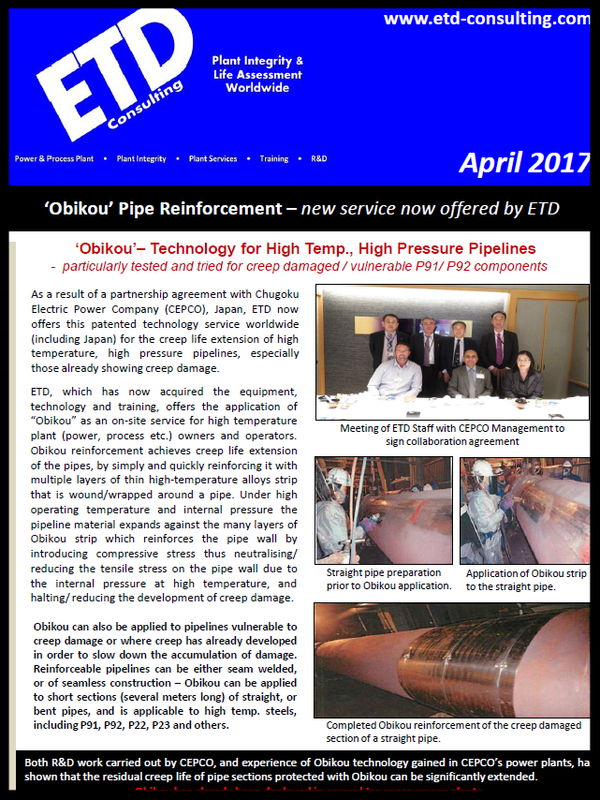 Details can be seen in the ETD's “Obikou” Newsletter by clicking on the image (right). References on the R&D work carried out in support of Obikou, Japanese plant experience with Obikou, and other details can be provided on request. Please contact: enquiries@etd-consulting.com.